Chris and his wife Jill began farming at Fairfield’s Farm in 1995 on a traditional orchard system that had some orchards already grubbed. The philosophy when Chris arrived here was to create and expand! The produce was to be targeted at quality and quantity, given the orchard system and the then limited orchard acreage that was at Fairfield’s at the time, the key was to reinvest and expand! Today the business is segmented into three parts, the initial being Fairfield’s our Home Farm, where the new tree wall system is producing fabulous Grade 1 Top fruit and an Equestrian Livery Business overseen by his wife Jill, the horse tenants and their owners enjoy the farm as orchards make fantastic riding pasture! We also have our own horses and ponies that are very competitive, Show Jumping ponies at a National level, and also a young Event Horse, Chanson du Village – currently showing all the signs of becoming a “real star of the future”. 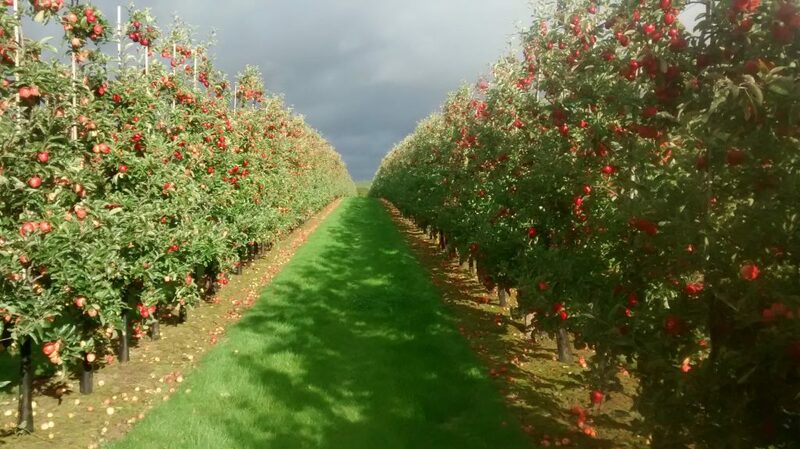 There is another rented Fruit Farm, producing both Top & Cider Fruit, just 2 miles away with 80 acres of orchards, this business produces some “on trend” varieties and many traditional varieties too! This farm has a very unique Apple Store – Farm Shop Style, offering the public who have travelled far and wide for 50 years to appreciate and enjoy the fruit, there is approximately 20 different Eating Apple varieties and Artisan Apple juice pressed from Junami & Cox. Another arm of the business is the Cider Fruit Orchards located within easy reach of Hereford, (Cider Capital of the UK), currently Chris manages/farms over 220 acres here, and has been perfecting the Cider Fruit produce there, for Bulmer’s, Weston’s and Thatcher’s Cider producers, applying techniques and cross-referencing skills from Top fruit into Cider Fruit production, with much success! All the Top fruit produced is Graded and Packed by Wye Fruit in Ledbury, the varieties that have been introduced to Fairfield’s with extensive reinvestment and innovative systems, thus fantastically producing fruit with amazing flavour, colour and texture from the Sandy Loam soils of the Three Counties. The quest to continue new techniques and maintain standards and ever fine-tuning results is to be continued too… Our son Oliver is passionate about farming and the business, so currently the future looks as rosy as the apples produced…and fabulous fruit will continue to be available for the UK consumer.